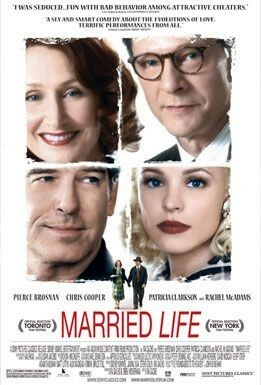 The theater where I saw Married Life didn’t even have a poster for it to hang outside. So I’m putting one up here, because I want to get the word out about this movie. It’s worth tracking down. It’s based on the 1953 novel Five Roundabouts to Heaven by John Bingham, the former MI5 operative who served as the inspiration for John Le Carré’s George Smiley. (Sarah Weinman reviews Bingham’s literary career here.) The adaptation by Oren Moverman and director Ira Sachs sets the action in 1949 New York and Connecticut. Chris Cooper’s longtime married man finds himself falling for a fetching war widow (Rachel McAdams). He’s certain his sweet, trusting wife (Patricia Clarkson) would be destroyed by divorce, so he decides that the only humane solution is to poison her. The whole sordid story is told by Pierce Brosnan, playing a lothario friend of Cooper’s with his own designs on McAdams. Brosnan looks rakish as all get out in period duds and narrates with silken menace. If ever a man was meant to do voiceover, it’s him. He should provide it for movies he’s not even in. There are some taut Hitchcockian suspense sequences, including a dandy involving a bathtub. Noir strings are plucked, but softly. Sachs is more interested in dark comedy and shrewd observations about the deceptions that go into marriage, happy and unhappy alike. It’s said that 90% of a film’s success is dictated by the casting, and that’s certainly true here; all four leads are terrific. Make an effort to see this one.